Takamatsu 高松 is a city in the Kagawa prefecture 香川県 of Shikoku Island (Japan’s 4th island). It is always hard to find vegetarian food in Japan, but it gets more difficult the more off the usual tourist trail you are. If you should find yourself in Takamatsu (高松) here are some restaurants where you will be able to find a few vegetarian dishes. A map showing where the restaurants are is at the bottom of this post. Thali Spice is located in the long covered shopping arcade. The entrance is on the ground floor and the restaurant is on the floor above. As the main restaurant is upstairs you’ll have to be careful not to walk straight past it. They serve plenty of vegetarian Indian and Nepalese cuisine including set thalis, and chana masala. They do a set lunch which is really good value for money, and if you can get one of their discount cards you’ll save even more. The staff are always friendly, and there is a good atmosphere in the restaurant. A good place to go for a cheap lunch, or a proper filling meal. There is also a Thali Spice counter in the food court of the Youme Town shopping centre. 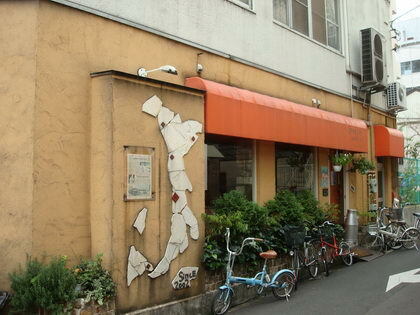 There are two Dear Italian restaurants in Takamatsu. There is a small one in the Tenmaya department store, but the main larger one is in the Sunport Tower. I’m reviewing the larger Sunport Tower restaurant. Italian cuisine in Japan isn’t as good as Indian for vegetarian options, but is still much safer than the native Japanese food! In Dear you’ll be able to get some fairly plain pizzas that are safe for you to eat. Unfortunately though all the pastas are made with chicken stock so you won’t be able to eat these (and when we asked they said they were unable to make the pastas without the stock). The Sunport Tower ‘Dear’ does have an English menu but if you don’t get it then you’ll find it useful to be able to read Katakana so you can see which pizzas you can eat. They have a margarita, and a few of the other pizzas can be ordered without their meat if you can speak Japanese. Spacca Napoli is a Naples style Italian restaurant. It is down a small street just North from Tenmaya. A Japanese guy who trained in Naples runs the restaurant. That combined with the proper wood burning oven makes this the most authentic Italian in Takamatsu. It is not as authentic as the real thing (they use tinned mushrooms), but they do use other real Italian ingredients such as mozzarella. It is very small and popular so you might have to wait to get a table but if you want a tasty pizza then this is a good bet. For vegetarians the best thing to do is to order a plain margarita and then add extra vegetable topping to make the pizza more interesting. Update 27th November 2011: Sri Balaji Takamatsu has now closed. Wherever you are in the world one of your safest bets for getting vegetarian food will always be an Indian restaurant. Sri Balaji, located in the Sunport Symbol Tower by the harbour in Takamatsu serves genuine South Indian dishes. You will be able to find masala dosa, mutter paneer and naans amongst many other dishes. They cook the dishes with authentic Indian spices such as curry leaves and mustard seeds – these aren’t easy to get in Japan if you are into your Indian cooking! The food is delicious and Sri Balaji became one of my regular restaurants whilst I was in Takamatsu. If you are a regular they have a stamp card which will get you money off a meal if you get enough stamps. I don’t know what this place is called (it has a Japanese name that I can’t fully read), but you can easily find it above the Franc Franc to the South of the large dome which is by the Mitsukoshi department store. They do a really good (mainly vegetable) buffet for lunch, although there is also meat, fish, udon and rice as well. As well as the pre-prepared food you can also choose some raw vegetables, and they will turn them into tempura for you. They do put fish dashi and other animal extracts in some of the vegetable dishes, so if you can speak Japanese ask one of the staff to tell you which plates are safe. Kagawa is famous for its Sanuki udon (a bit like thick spaghetti – usually served as a soup) so it would be a shame to miss out. In the covered shopping arcade are a few udon places that do yudame. Yudame is udon served in water soup rather than fish soup as many other udon dishes are. 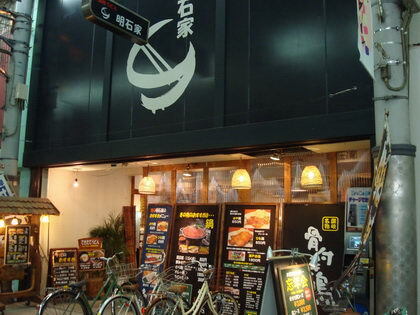 The udon restaurant I recommend is located in the long covered shopping street on the East side. I’m afraid I don’t know the name of the restaurant as I can’t read the Japanese but there is a photo of the front below. This is a canteen style restaurant so you’ll need to get a tray and ask for yudame udon. You can then get other items to put on top or on the side. The marinated tofu and inari sushi (tofu pouch filled with rice) are vegetarian. After you have paid you can add a few extra toppings such as soy sauce and spring onions for flavour. You will get a small container of fish sauce with your Udon – just don’t use it! Sibayo is an old fashioned looking restaurant just outside the shotengai area. It is opposite the NHK building. See the map for its precise location. You’ll need to take your shoes off before coming in, and once inside there are two vegetarian dishes that you can order for lunch. 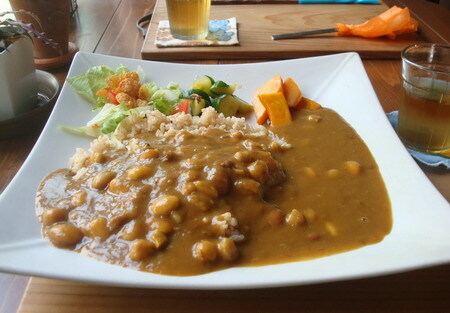 The menu is on a black board written in Katakana / Kanji, but the ones to look out for are the Mame Mame bean curry (in the photo below), and the vegetable plate. If you want the Mame Mame bean curry get there early as it can sell out quickly. 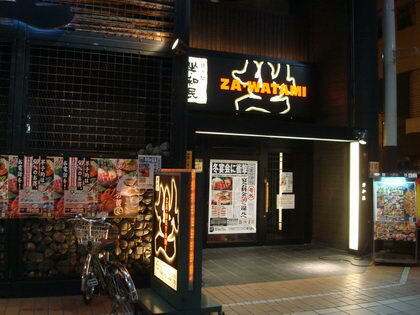 If you want a more authentic Japanese eating experience than Indian and Italian, then try Za-Watami. You’ll find it in the covered shopping arcade. It is one of those places where you’ll have to take your shoes off to go in – they have lockers for your shoes. Be warned though you may need to speak some Japanese to customise your order. Most of the food is not vegetarian! They have a pizza with bacon – if you are able to ask for it to be made without bacon (bacon nashi), and verify that the staff have properly understood you, then you’ll have a basic margarita pizza. You can also order onion rings, chips, and some vegetables, plenty for a meal. Za-Watami is more expensive then the other options I’ve given but if you want to feel more like you are in Japan when you are eating, then give it a go. Ramjham is located a short distance from Thali Spice just out of the West side of the covered shopping arcade. Plenty of tasty vegetarian options. It isn’t easy to find a vegetarian burger in Japan, but at Freshness Burger in the Sunport building you can find two! It is on the floor below Dear and Sri Balaji. You can get a tofu burger, and a bean/vegetable burger. Both are good but I’d recommend the bean/vegetable burger. Order from the counter, and five minutes later they’ll bring the burger to your table. You can also order chips for the complete burger experience. This is a good place to come if you want a quick vegetarian lunch. Here is a map showing where in Takamatsu the restaurants are. I’ve tried to position the pins as accurately as I can but I apologise if there are slight inaccuracies. You can read more about Takamatsu in my Takamatsu ‘what to do there’ guide.